Well here we go! I’m so pleased to be taking part in the Mystery Blog Swap over at The Sardine Tin, my post has been sent to my partner and here is the great post she’s kindly sent to me but who wrote it? Guess who? 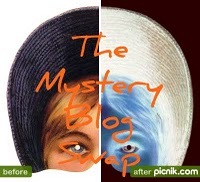 A memorable day in the life of a mystery blog swapper. It was a usual Friday. We were awoken by a small boy clambering into our bed and a slightly bigger girl hovering next to it and demanding oatmeal. We live our lives by all sorts of weekly routines, one of which is oatmeal for breakfast on Fridays. We also have TV after daycare on Tuesdays and Fridays, snacks in the car on the way home on Mondays, Tuesdays and Fridays, gymnastics class on Thursdays, packed lunches on Tuesdays and Thursdays, hot lunch at daycare the other days. We have pancakes on Saturdays, chocolate croissants on Sunday. With two full time jobs and two kids we find that routine is our friend. Deviations can mean disaster. My Friday at work was filled with the usual scientist fun; moving small volumes of liquid from one place to another with mind numbing repetition, then generating reams of numbers from the experiments and turning them into graphs, then cutting out these graphs and sticking them into notebooks. I always feel as if I should get the kids to come and assist me with this part of my job. I spend far too much time cutting and pasting (and I don’t mean electronically, I mean colored bits of paper and UHU glue sticks) for a highly educated adult. The rest of the day was spent tweaking graphs and charts, generating slide shows and talking about the data in meetings and conference calls. Some Fridays our company president opens up the wine cabinet she has in her office and shares a couple of rather nice bottles with whoever happens to be around at 5.15pm on the last day of the week. Even though I try to get the kids by 5.30pm, I am often tempted to have a little glass, and to socialize with those who are not running out of the door to pick up their children. I had a nice glass of California Cabernet on this evening, and just as I left the building, my phone rang. Is it just me or do all working mums feel their heart flip a little when they see “daycare” on the caller ID? This time the perpetual undercurrent of anxiety was justified. My little boy had taken a tumble and cut his head. Fortunately daycare is only a few minutes away, so I sped over, cursing myself for staying that extra fifteen minutes at work for the wine. I arrived to find him sitting stoic and pale, with the saddest face in the world. His mouth was fixed in a perfect upside down smile, and his expression wobbled into tears when I hugged him. A big band aid covered his forehead. “Don’t look under the band aid, just take him to the doctor”, the teacher advised, yet at the same time assuring me that it wasn’t all that bad. I vacillated on where to take him. There are several emergency rooms in the city, but the closest one is at what is known as “the county hospital”. Much like “County” in the TV show ER, this hospital is the only one in the city obliged to serve anyone, insured or not, so needless to say it attracts a colorful cast to its ER. It actually quite resembles the hospital in that much missed TV show. I’m always rather disappointed not to run into the young George Clooney whenever I find myself there. I had never taken the kids there before though, in fact this was our first real emergency. It is pretty amazing for a three year old boy to get this far in life without requiring emergency medical attention, I reassured myself. We decided to risk it, 6pm on a Friday hopefully being early enough to avoid the crowds, crackheads and crazies, and we got lucky. They sent us straight up to the children’s hospital, where the doctors (all at least ten years younger than me) removed the band aid and I saw the deep, bloody gash in the poor boy’s face. They were unconcerned and matter of fact, deemed it a perfect job for the wound glue, and soon had it expertly closed up. I had my five year old daughter with me through the whole ordeal. She handled it all remarkably, comforting her little brother, remaining quiet and well behaved even though she was hungry and tired and is often upset by changes to her well ordered routine. The memorable day has now become part of our history. I love how the children like to narrate and relive the days on their life that stand out. We talk a lot about birthdays and Christmases past, about visits to the aquarium or the zoo, and now we talk about the day little boy broke his head. We drive past “County” every evening on the way home, and every night since he has pointed it out and said to me “Mummy, remember when I got a big hole in me? That is where they mended me!”. I’m hoping there won’t be a scar left behind from the cut, but even if there is he will have a story to go with it. I am a Mother, a wife, a lover, a daughter, a friend but mostly I’m a woman. Time to shake off the labels and just let the words roll out….